We deliver these savings by distributing free prescription drug discount cards. These pharmacy discount cards are provided free of charge both to the organizations and agencies helping to distribute the drug cards and to the people who receive the cards. 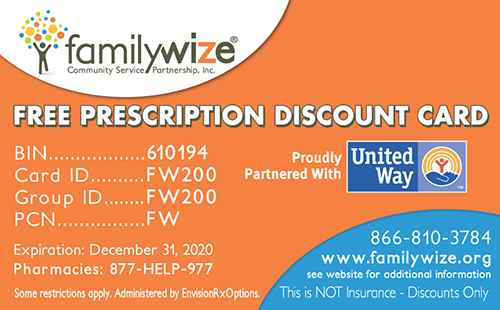 All funding for the FamilyWize prescription card program is provided by part of the dispensing fee that is included in the cost of medicines when a FamilyWize card is used to save you money, and by in-kind donations and reduced costs from the program sponsors. The FamilyWize Community Service Partnership was established in 2005 by Dan and Susan Barnes to reduce the cost of prescriptions for people who live and work in Lehigh Valley, Pennsylvania. Distribution of these cards was later coordinated by the local United Way. United Ways in other communities quickly heard about the program and started asking if they could get cards for their communities. Sadly, many families in the United States need a FamilyWize card, either because they have no health insurance or they have to buy medicine that is not covered by their insurance, Medicaid or Medicare plans. More than thirty thousand community and faith-based organizations, county agencies, doctors, pharmacies, companies, and individuals across the country are now joined together in this partnership to distribute free FamilyWize prescription drug discount cards in their communities, reducing the cost of medicine for people in one out of every two counties in the United States. More than 1,000 participating United Ways, America’s Promise Alliance Partners, and individual counties in all 50 states have volunteered to coordinate these distribution efforts. We hope you will join us in thanking your local pharmacies, the program sponsors, and the thousands of community and faith-based organizations, local and county agencies, physicians, companies and individual volunteers that have dedicated their time and resources to help make these FamilyWize cards available to those in need. Working together, we are making a difference, a $1 billion difference.